Enterprises need the flexibility to customize services according to their unique business needs and deploy new services quickly while keeping costs under control. 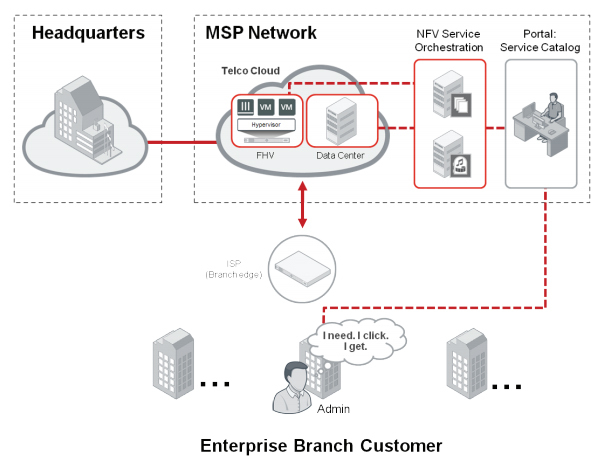 Today’s traditional branch infrastructures with multiple dedicated CPE hardware make it challenging and costly to deploy custom services fast or bring a new branch online. Our hybrid virtual appliance simplifies and accelerates deployment of customized services on demand, with support for both universal CPE and cloud-based hosting models. Supports the widest Fortinet and thirdparty VNF and VM eco-system to enable rapid service delivery at reduce capex for enterprises. Several SD-WAN and Orchestration security fabric partners are validated. Powerful Intel processer combined with SPU hardware acceleration delivers the high security performance. 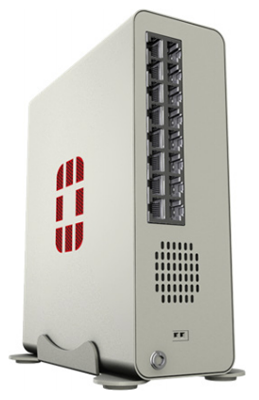 Ample storage and memory produce excellent compute and network performance. Today, the ability to quickly deploy new branch services is hampered by the complexity and costs involved in bringing a new branch office or service online. Managed service providers (MSPs) find it challenging to maintain and upgrade multiple on-premises equipment for their enterprise customers. 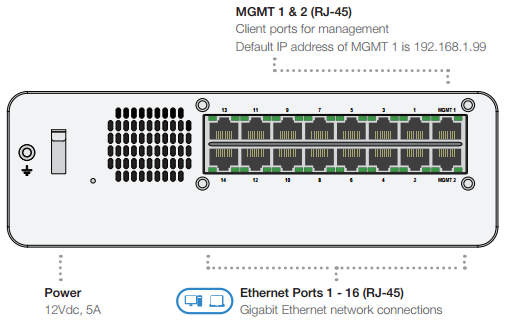 The operational complexity of managing multiple on-premises equipment can cause significant delays in time to deploy and market new services, reducing profitability. 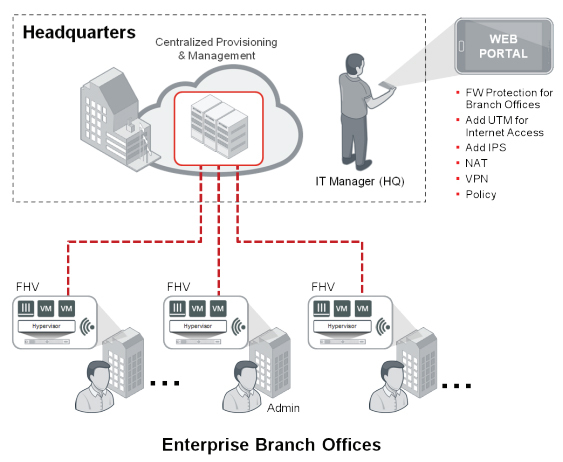 Enterprises need the flexibility to adapt their branch offices to their changing business needs in a secure and fast manner. They need the ability to turn up new services on demand from a single platform without the cost and complexity of deploying and managing additional devices, expertise which most branch personnel do not have. Network Function Virtualization (NFV) enables MSPs to deploy network services as virtualized functions that are decoupled from hardware and chained together, eliminating the need for multiple dedicated CPE. NFV centralizes and automates key operational processes such as service creation and provisioning, accelerating service delivery. NFV also opens the door to upsell additional services to create differentiation. Cloud-based service orchestration via NFV platforms reduces on-site provisioning, lowers costs and accelerates service delivery. FortiHypervisor is making the promise of rapid service delivery a reality for enterprises and MSPs. Built to deliver virtualized services as virtual network functions (VNFs), FortiHypervisor consolidates advanced networking and security services on a single device, eliminating the need for multiple CPE while enabling on-demand service delivery. 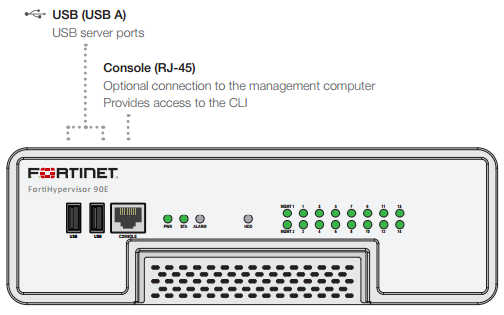 Both a pure software instance for generic x86 platforms and a FortiGate hardware-based hybrid appliance are available. A powerful Intel processor combined with FortiASIC hardware acceleration delivers the high security performance that customers have come to expect from Fortinet. Ample storage and memory produce excellent compute, network and security performance. FortiHypervisor is available as a hybrid CPE running on FortiGate hardware, and a virtual CPE software instance that can be deployed on any generic x86 platform. FortiHypervisor supports the following on-premises and cloud-hosted use cases. Enterprise "branch in a box"
The following table illustrates the performance of a single FortiGate VM04 running on the FortiHypervisor appliance. 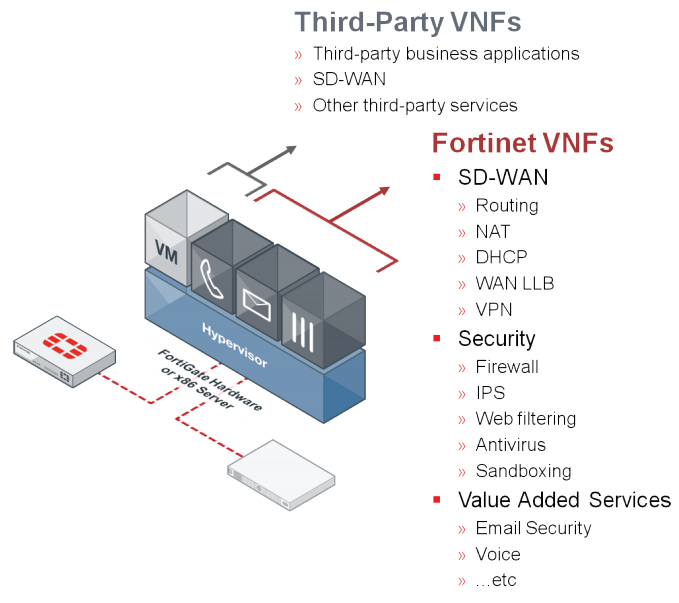 Download the Fortinet FortiHypervisor Data Sheet (PDF).